If you’ve been reading my blog you know I’ve been daydreaming about a summer family road-trip. How about you? Will you be flying or driving this summer? I’m trying to save money and so will be going by car, which raises all sorts of interesting memories from my childhood. 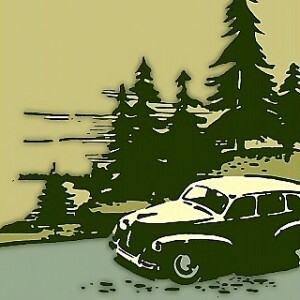 What do you remember for childhood road-trips? Results of this recent national survey* commissioned by TeleNav, Inc., a global wireless location-based services providers, indicate that when planning to hit America’s roadways for the beloved road trip, men and women have many, and sometimes differing, opinions as to what roles each member of the couple should fill. From who normally drives, to who gets lost more, to who requires more “pit-stops,” the survey results provide insight into what is happening inside the cars of American couples as they hit the road. 81% of men indicated they have a better sense of direction than their significant other. In contrast, only 45% of women felt they possess a better sense of direction than their partner. Only 32% of men admitted to getting lost more often than their significant other while driving. 52% of women reported that they lose their way more than their significant other. When asked what annoys them most when their significant other is driving, the most frequent response from men was that their significant other drives too slowly. The most common response from women was that their partner follows another vehicle too closely. When in the driver seat, the largest number of men indicated that the most annoying thing their significant other does is tell them to slow down. The most common response from female drivers regarding their top annoyance is when their partner criticizes the route they take to a destination. The largest amount of male respondents indicated that most of their in-vehicle arguments were the continuation of an argument that started prior to hitting the road. That was followed by the couple having opposing views on how to get to the location. 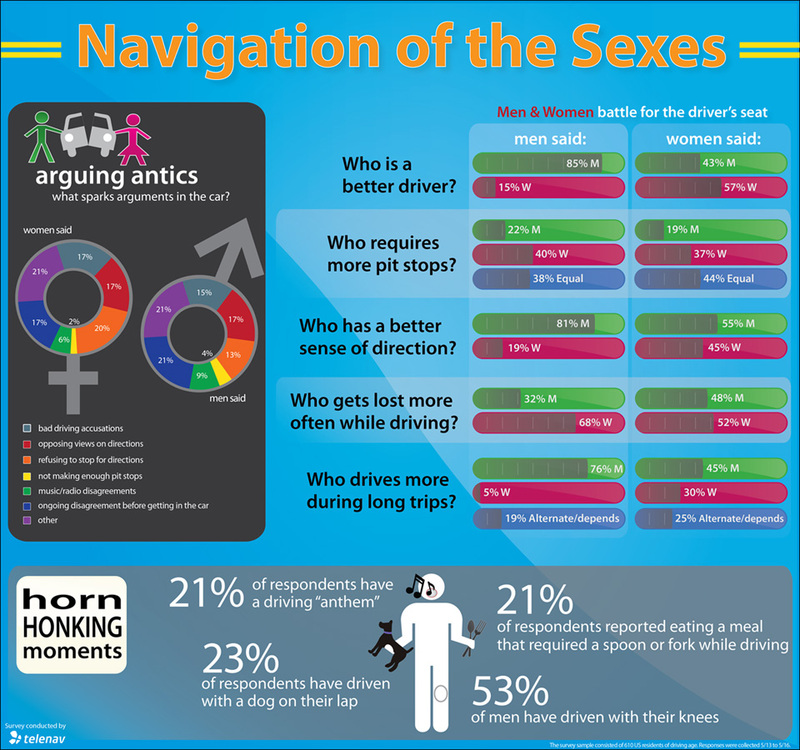 The highest number of female respondents indicated that the most frequent cause of arguments in the vehicle was due to one partner refusing to pull over and ask for directions. This was followed by one partner accusing the other of being a bad driver. Only 22% of men said they need more stops than their significant other on a trip. Results suggest that women may require more stops, with 36% of women indicating they have to stop more than their significant other. 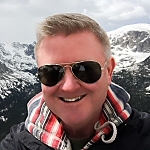 A number of couples seem to have found a compromise, as 38% of men and 44% of women reported that they need the same amount of pit stops as their significant other while on a trip. 62% said they have no guilt with using the restroom and not purchasing anything. Hey Man, it’s Your Turn to Drive! 76% of men indicated they are responsible for driving compared to just 30% of women who reported they are the sole handler of driving duties. When it comes to shorter trips around town with their significant other 84% of men said they take the wheel, compared to only 45% of women who let their significant others ride shotgun. The discrepancy in responses may indicate women and men have selective memories when it comes to who takes the wheel more often on short trips. Why do men take the wheel more than women? Compared to just 57% of women who said they handle the wheel better than their male counterparts. When asked if they enjoy driving, 42% of men said they get behind the wheel as often as they can compared to just 26% of women. Twice as many men than women admitted that they have driven a vehicle with their knees at one point. When asked if they had ever groomed themselves while driving (put on make-up for women or shaved for men), four times as many women answered yes than men. Anything surprising in these results for you? Will you be taking a road-trip this summer? I’m trying to save money so if we do it will be by car, which raises all sorts of interesting memories from my childhood. What do you remember for childhood road-trips? *The survey sample consisted of 610 (310 male/300 female) US residents of driving age. Results are reprinted with permission from Current Lifestyle Marketing representing TeleNav. No compensation was provided for this post. We will be driving for our vacation this summer too! Not looking forward to it…but it is something I have been doing all my life. I think I was 18 or 19 when I took my first flight! I am going against the “girls’ club” here and just admitting the plain ole truth. Hubby is the better driver…..way better! He has an uncanny sense of direction (he only has to drive someplace once, and can always remember), so he never gets lost. He can drive a long time because he is used to spending many hours in a vehicle for his job. He is much better with blocking out noisy children while travelling busy city highways. Hard to tell who would need a pit stop more because our stops are based on the kids. But I win on two counts: better DJ, and great picnic basket packer! I don’t think he minds that he does the bulk of the driving. After all, the co-pilot seat is the one responsible for handing out snacks/drinks, reading Dora books, changing DVD’s, settling disputes regarding who DID touch who first, and NO Barbie certainly could not beat Iron Man in a duel, plus, singing lullabies to fussy baby. Please, driving 6 hours is the easy job. Oh, and pumping breast milk with car adapter too. I definitely win that one. Our typical summer vacation drive takes roughly 2 – 3 days — if we drive at night while the kids sleep in the car. We travel 1503 km (933 miles to you)! After 5 summers, we have it down to a science. 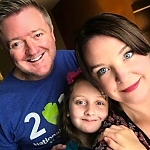 Our first trip was with only 1 child…and #’s 2, and 3 have never know anything different. The kids pack 1 small backpack each filled with car toys, books, crayons, etc. I pack enough snacks to feed an army. And we never drive more than 2 1/2 to 3 hours at a time. Even I get restless by then. Oh yeah, dual screen portable DVD helps too. You just gotta go for it. Expect the first one to have some kinks….maybe even complete disaster. But it will get easier the more you do it. And it is a great bonding experience for the family. When you’ve mastered it…..your next challenge….camping with children!! My husband always drives on road trips but he gets lost often. Thankfully we have Google Maps on our phones and can use that to get back to civilization. I heart Google Maps, Jessica! It’s interesting that you are the second person bucking the “guys have a better sense of direction” trend. 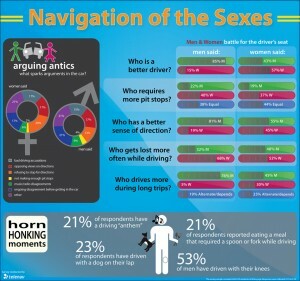 I did think on average the sexes navigate differently (e.g. when giving/getting directions guys use directions like north, south, etc… and women tend to use landmarks more)? No arguments here. Husband always drives, unless it is a super long drive, then I will take the wheel so he can rest. He has a much better sense of direction, whereas I get lost going around a block, Also, I tend to the kids when they need snacks, drinks, entertainment, while he drives. It works! I’ve always wanted to take a summer road trip with my family. We do a lot of road trips, but there is always an agenda (wedding, family event, business, etc. ), never a vacation. That is my dream!! When I was kid, we drove to every vacation. I remember not having air conditioning and dad being the only one allowed to have his window down. His window was the “hot air out window.” I also remember having Gameboy battles with my brother like tetris. We always got multiplayer games, hooked up both of our Gameboys (yes, before the days of bluetooth) and had tournaments. I know what you mean, Ivy. Until recently many of our trips have been either for weddings or Thanksgiving. Much of my wife’s family and friends are on the East coast, and so far we’ve flown. But two summers ago we did a road-trip to Colorado, and now have done each each year since. I’ve done long trips in the past, but never with a child. My family used to do road-trips every summer when I was a kid though. It’s probably that nostalgia that makes it sound appealing to me. Oh and who has the better sense of direction? In our family, the dark side leads us. Darth Vader narrates our Tom Tom. Without Darth, although we do argue with him, we would get no where!